Are you ready to plan your best birthday party yet? Consider the many reasons to plan a birthday sailing charter on the Liberte. If you find yourself doing the same thing for your summer birthday each year, why not change it up? Celebrate your birthday having fun on the water with a birthday party on the Liberte! 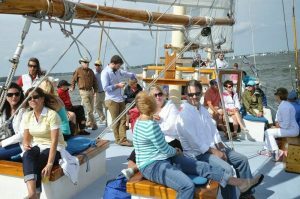 As you sail along the waters of Cape Cod, you and your friends can enjoy a private party complete with food, drinks, and music to celebrate your birthday in a unique and exciting way. Are you ready to plan your best birthday party yet? Consider the many reasons to plan a birthday sailing charter on the Liberte. A birthday party on a charter boat allows you to celebrate with a private party for you and your friends. Unlike a restaurant or bar, your party will be secluded from the public on the water, with only you and your friends to enjoy the day! On the Liberte, you are about to control the duration of your party so that your mini-getaway lasts as long as you like. Because there is limited space on the charter, you are able to celebrate with your closest friends and family in an intimate yet exciting celebration on the Liberte. On the Liberte, we offer a list of recommended purveyors in Cape Cod. With this, you are able to choose from a wide selection of food for your celebration, including appetizers and entrees to enjoy with your family and friends. If you prefer to bring your own favorite foods along, you can do that as well. You will also have access to a fully stocked bar, so you can enjoy a signature cocktail for your birthday as you sail around Cape Cod. In hosting your birthday party on a charter boat, you are creating memories of a special celebration that you and your guests will remember for years to come. If you are looking to celebrate your birthday with a special theme party, the Liberte offers a variety of birthday themes to celebrate with for your special day. Among some of our most popular themes is the pirate theme party, in which you and your guests can celebrate like pirates on the sea. No matter which theme you choose to celebrate, a sailing birthday party on the Liberte will make your celebration unforgettable! Enjoy Your Birthday Party in Cape Cod with a Sailing Party on the Liberté! This entry was posted on Friday, June 8th, 2018 at 1:01 pm. Both comments and pings are currently closed.